For safe delivery your order of pheasants must total 30, 60, 90, or 120. You can combine breeds in your order as long as it totals the numbers listed above. If you are buying Pheasants, please check with the state regulatory agency that controls wildlife management. Pheasants are available from April through July. We need to know about cancellations by 10 a.m. Thursday before your ship date, otherwise you will be responsible for the shipping and handling charges. Contact your State Fish Wildlife Department for any required permits prior to ordering. If a permit is required and you don't have it your order will be cancelled. The following states do require permits before shipment. Other states please contact your State Fish Wildlife Department for any required permits prior to ordering. If a permit is required and you don't have it your order will be cancelled. The state of North Dakota requires the Animal Board of Health number to be on the health certificate that is sent with the birds. You will need to provide us with this number before the birds can be sent. The state of New Hampshire requires the NH Fish and Game Permit number be on the health certificate that is sent with the birds. You will need to provide us with this before the birds can be sent. You need to contact Cindy at 603-271-2404. The state of West Virginia requires an **Importation Permit for all orders. This number has to be on the Health Certificate, which is sent with the birds. You will need to contact the WV Dept. of Ag., Vera Wills @ 304-558-2771, ext. 51921. There is no charge for this permit. You will need to provide us with this before the birds are sent. **This applies to Quail also! The state of Maine now requires that you apply for import permit prior to shipment of Chukars and Pheasants. You will need to contact the Maine Department of Inland Fisheries and Wildlife, Christina at 207-287-5261, You must apply for this once your order has been placed. This is necessary for the paperwork that is shipped with the birds. Otherwise they cannot be shipped. Wyoming requires a vet check on quail orders entering the state. That is an additional $50. per quail order. Brought from China, these beautiful wild birds are delicious to eat and a colorful addition to your yard or farm. These beautiful birds are very similar to the Chinese ringnecks in appearance only they are larger. 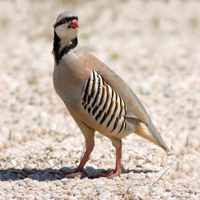 The Chukar / Redleg Partridge is a small, flighty bird, known for their ability to fly. They are a favorite addition to gamebird hunts, domesticate readily, and a real pleasure to have around. These originated within feral stock in Europe over 100 years ago. The males are entirely dark with a glossy green and blue shade to them.